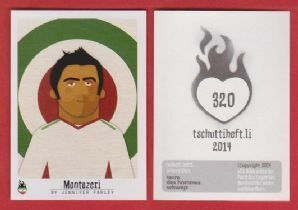 Foreign Football sticker, issued by Tschutti Heftli for the 2014 World Cup. Measures approximately 5 x 6.8cm. Depicting the Iran and Umm Salal star Pezman Montazeri. Each sticker has been drawn by a commisioned illustrator.